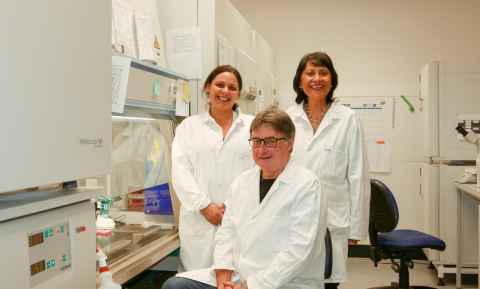 Dr Ofa Dewes (right), Principal Investigator, and Professor Peter Shepherd, Deputy Director (centre), Maurice Wilkins Centre for Molecular Biodiscovery and Department of Molecular Medicine and Pathology, Faculty of Medical and Health Sciences, with Dr Tamasin Taylor, Postdoctoral Research Fellow, Auckland University of Technology. The Maurice Wilkins Centre is New Zealand’s Centre of Research Excellence targeting major human diseases. Based at the University of Auckland, the Centre serves as a national hub for molecular biodiscovery and includes research scientists from major universities in New Zealand. The aim of the Centre is to deliver translational outcomes in the areas of diabetes, obesity, cancer, and infectious diseases. Understanding the differences in fructose absorption is a world-first research partnership programme between scientists, high school students and their communities to enable them to make informed decisions, attract community involvement in school science programmes, benefit from long-term health and educational outcomes, and meet high school curriculum goals and strategic research outcomes. By involving student communities from schools across the country we will have a better understanding of the science behind sugar and be able to develop sustainable intervention strategies for the right population, and the right patient.